Get a taste of the high-life and buy or lease the new 2018 INFINITI QX60. When you own the new 2018 INFINITI QX60, you’ll enjoy a first-class driving experience that gives your commutes a touch of class and sophistication. This luxury crossover is the perfect companion for any errand or road trip thanks to its powerful V6 engine, intuitive technologies, and innovative safety systems, so why not experience what pure luxury feels like? You can get behind the wheel of this alluring INFINITI crossover now at our INFINITI dealership near Thornton, CO, so schedule a test-drive today and fulfill your dreams. Every Colorado driver is different, which is why the 2018 INFINITI QX60 can easily tailor its performance to your liking and personal preferences. With the INFINITI Drive Mode Selector with Standard, Sport, Snow and Eco modes, you’ll be able to enjoy a personalized drive every time you slide behind the wheel of this capable crossover. You’ll also be able to dart down every road, as each trim of the 2018 QX60 comes with a 3.5-liter V6 engine that races to 295 horsepower in a flash. Plus, when you opt for available Intelligent All-Wheel Drive (AWD), you can tour with confidence over sand, mud, snow and rock. And thanks to intelligent safety features such as an Around View® Monitor with Moving Object Detection and Front and Rear Sonar System, you’ll enjoy peace of mind the moment you pull out of your driveway. The 2018 INFINITI QX60 has been designed to keep you connected, informed and entertained whether you’re headed into the heart of Chicago or across state borders. When you and your guests venture out in your 2018 QX60, you’ll enjoy the premium convenience of an optional INFINITI InTouch™ infotainment system that helps you control your phone, music and navigation all on the go. For those who classify themselves as music lovers, you’ll enjoy endless commercial-free radio stations when you opt for SiriusXM® Satellite Radio. And if you want the ultimate audio experience, consider upgrading for an available Bose® Cabin Surround® 15-speaker sound system with digital 5.1-channel decoding. As you scroll through your various tech options, take a moment to nestle further into your sophisticated leather-appointed seats that make for the ultimate VIP traveling experience. For added comfort, opt for heated front seats and a heated steering wheel to ensure even the coldest of mornings are still enjoyable. If you’re on your way to pick up your friends, know that this INFINITI crossover can seat up to seven comfortably without sacrificing legroom, so you can pile in your friends until your three rows of seating are full. So, open up your optional moonroof, let the fresh air in and get on your way to your next adventure in unmistakable style. 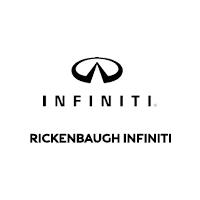 If The New 2018 INFINITI QX60 Sparks Your Interest, Visit Rickenbaugh INFINITI Today To Take It For A Test-Drive. We Think You May Have Just Found The Luxury Crossover For You.